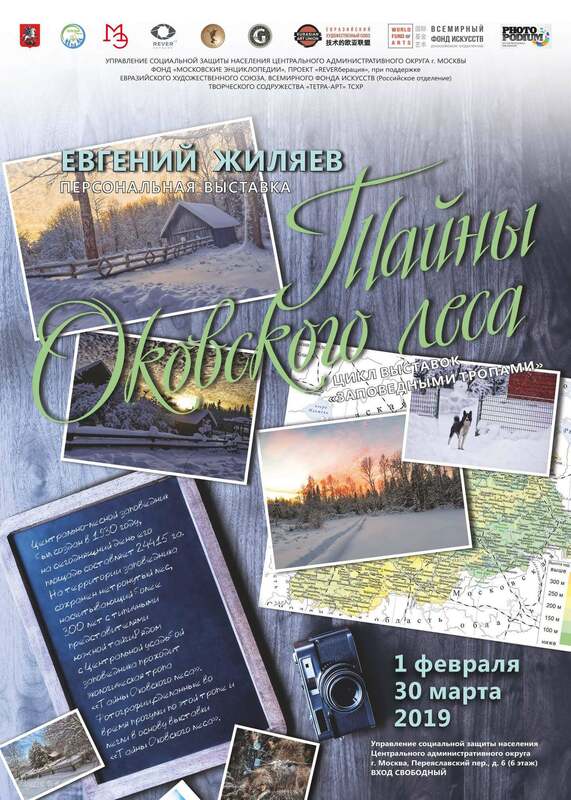 From February 1 to March 30, 2019, in the Social Services Administration of the Central Administrative District of Moscow, there will be a personal photo exhibition of Yevgeny Zhilyaev entitled “Secrets of the Okovsky Forest”. The exhibition is organized by the Moscow Encyclopedia Foundation within the framework of the project # REVERberation, with the support of the Eurasian Art Union, the World Foundation of Arts (Russian Department), the TETRA-ART Creative Union TSHR. Who among us in childhood did not dream of being in the fairy tale “Frost” or “Twelve Months”? I did not imagine that the sparkling snow was precious stones, and now Grandfather Frost with the Snow Maiden would come out of the forest, and behind them other fairy-tale characters. But growing up, we stop believing in fairy tales and miracles, only occasionally, sneakly presenting ourselves in a fabulous winter forest. In the crystal silence of which the snow crunches a little and the fussy titmouse hurries to share the news with us. No matter how many years we have, but the real winter seems to us fluffy snowdrifts, green spruces, blue sky and frost biting on the cheeks. Is there such a place really? Residents of a large city is extremely difficult to believe in its reality. Meanwhile, such a place really exists. With their paths and secrets. Crystal air and silence. A place where the trees are 300 years old and they wisely nod their gray tops to the beat of our thoughts and smile a little indulgently, catching astonished eyes. The personal exhibition of Yevgeny Zhilyayev, “Secrets of the Okovsky Forest” invites us to a fabulous walk to the Central Forest Reserve, located in the Tver Region, the total area of ​​which is more than 705 square meters. km This is an amazing place that has preserved its primeval beauty and unique flora and fauna, which could easily be described in many fairy tales we know from childhood. Well, go ahead! On the magical paths of the Okovsky Forest, each of us will surely meet a kind wizard or wise Leshego, not to mention real wild animals, snow drifts of human height and the opportunity so desirable for every tired traveler to spend the night in silence before the fire stove. We heartily congratulate our beautiful author with the exhibition and wish them new creative successes! !